In 1985, when Carl Sagan was writing the novel Contact, he needed to quickly transport his protagonist Dr. Ellie Arroway from Earth to the star Vega. He had her enter a black hole and exit light-years away, but he didn’t know if this made any sense. The Cornell University astrophysicist and television star consulted his friend Kip Thorne, a black hole expert at the California Institute of Technology (who won a Nobel Prize earlier this month). Thorne knew that Arroway couldn’t get to Vega via a black hole, which is thought to trap and destroy anything that falls in. But it occurred to him that she might make use of another kind of hole consistent with Albert Einstein’s general theory of relativity: a tunnel or “wormhole” connecting distant locations in space-time. While the simplest theoretical wormholes immediately collapse and disappear before anything can get through, Thorne wondered whether it might be possible for an “infinitely advanced” sci-fi civilization to stabilize a wormhole long enough for something or someone to traverse it. He figured out that such a civilization could in fact line the throat of a wormhole with “exotic material” that counteracts its tendency to collapse. The material would possess negative energy, which would deflect radiation and repulse space-time apart from itself. 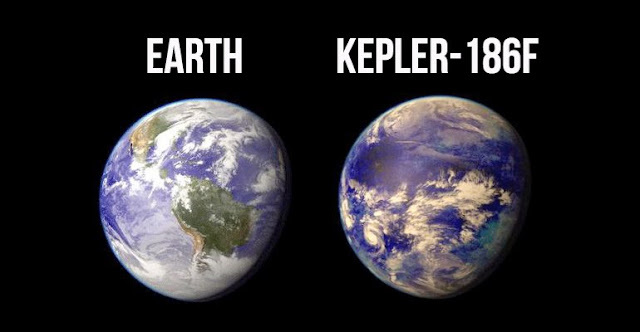 Sagan used the trick in Contact, attributing the invention of the exotic material to an earlier, lost civilization to avoid getting into particulars. Meanwhile, those particulars enthralled Thorne, his students and many other physicists, who spent years exploring traversable wormholes and their theoretical implications. They discovered that these wormholes can serve as time machines, invoking time-travel paradoxes — evidence that exotic material is forbidden in nature. 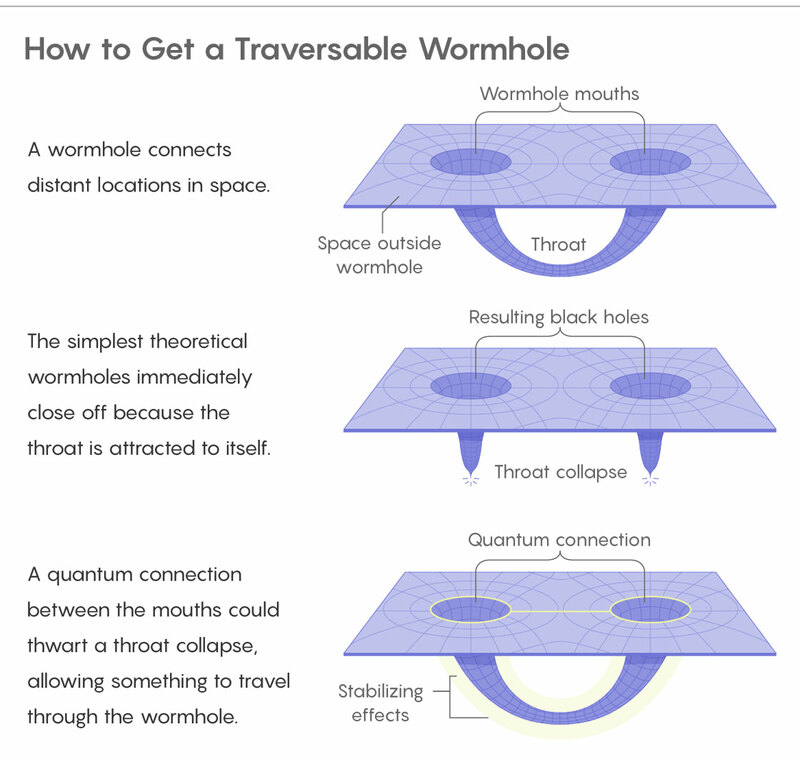 Now, decades later, a new species of traversable wormhole has emerged, free of exotic material and full of potential for helping physicists resolve a baffling paradox about black holes. This paradox is the very problem that plagued the early draft of Contact and led Thorne to contemplate traversable wormholes in the first place; namely, that things that fall into black holes seem to vanish without a trace. This total erasure of information breaks the rules of quantum mechanics, and it so puzzles experts that in recent years, some have argued that black hole interiors don’t really exist — that space and time strangely end at their horizons. The flurry of findings started last year with a paper that reported the first traversable wormhole that doesn’t require the insertion of exotic material to stay open. Instead, according to Ping Gao and Daniel Jafferis of Harvard University and Aron Wall of Stanford University, the repulsive negative energy in the wormhole’s throat can be generated from the outside by a special quantum connection between the pair of black holes that form the wormhole’s two mouths. 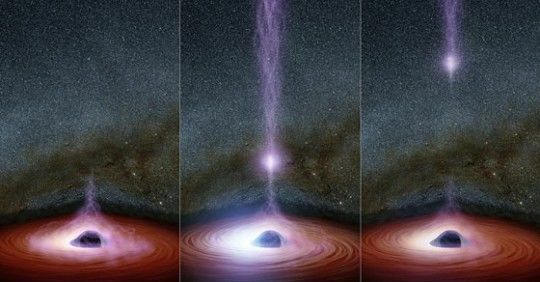 When the black holes are connected in the right way, something tossed into one will shimmy along the wormhole and, following certain events in the outside universe, exit the second. The paradox has loomed since 1974, when the British physicist Stephen Hawking determined that black holes evaporate — slowly giving off heat in the form of particles now known as “Hawking radiation.” Hawking calculated that this heat is completely random; it contains no information about the black hole’s contents. As the black hole blinks out of existence, so does the universe’s record of everything that went inside. This violates a principle called “unitarity,” the backbone of quantum theory, which holds that as particles interact, information about them is never lost, only scrambled, so that if you reversed the arrow of time in the universe’s quantum evolution, you’d see things unscramble into an exact re-creation of the past. Many theorists believe in black hole interiors (and gentler transitions across their horizons), but in order to understand them, they must discover the fate of information that falls inside. This is critical to building a working quantum theory of gravity, the long-sought union of the quantum and space-time descriptions of nature that comes into sharpest relief in black hole interiors, where extreme gravity acts on a quantum scale. The quantum gravity connection is what drew Maldacena, and later Jafferis, to the ER = EPR idea, and to wormholes. The implied relationship between tunnels in space-time and quantum entanglement posed by ER = EPR resonated with a popular recent belief that space is essentially stitched into existence by quantum entanglement. It seemed that wormholes had a role to play in stitching together space-time and in letting black hole information worm its way out of black holes — but how might this work? 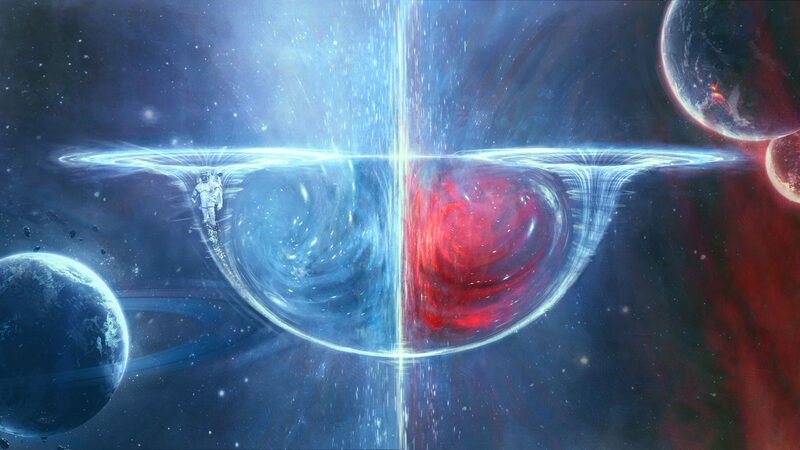 When Jafferis heard Maldacena talk about his cryptic equation and the evidence for it, he was aware that a standard ER wormhole is unstable and non-traversable. But he wondered what Maldacena’s duality would mean for a traversable wormhole like the ones Thorne and others played around with decades ago. Three years after the South Korea talk, Jafferis and his collaborators Gao and Wall presented their answer. The work extends the ER = EPR idea by equating, not a standard wormhole and a pair of entangled particles, but a traversable wormhole and quantum teleportation: a protocol discovered in 1993 that allows a quantum system to disappear and reappear unscathed somewhere else. When Maldacena read Gao, Jafferis and Wall’s paper, “I viewed it as a really nice idea, one of these ideas that after someone tells you, it’s obvious,” he said. Maldacena and two collaborators, Douglas Stanford and Zhenbin Yang, immediately began exploring the new wormhole’s ramifications for the black hole information paradox; their paper appeared in April. On the right side of a chalk-dusty blackboard, Maldacena drew a faint picture of two black holes connected by the new traversable wormhole. On the left, he sketched a quantum teleportation experiment, performed by the famous fictional experimenters Alice and Bob, who are in possession of entangled quantum particles a and b, respectively. Say Alice wants to teleport a qubit q to Bob. She prepares a combined state of q and a, measures that combined state (reducing it to a pair of classical bits, 1 or 0), and sends the result of this measurement to Bob. He can then use this as a key for operating on b in a way that re-creates the state q. Voila, a unit of quantum information has teleported from one place to the other. Say Alice throws qubit q into black hole A. She then measures a particle of its Hawking radiation, a, and transmits the result of the measurement through the external universe to Bob, who can use this knowledge to operate on b, a Hawking particle coming out of black hole B.
Bob’s operation reconstructs q, which appears to pop out of B, a perfect match for the particle that fell into A. This is why some physicists are excited: Gao, Jafferis and Wall’s wormhole allows information to be recovered from black holes. In their paper, they set up their wormhole in a negatively curved space-time geometry that often serves as a useful, if unrealistic, playground for quantum gravity theorists. However, their wormhole idea seems to extend to the real world as long as two black holes are coupled in the right way: “They have to be causally connected and then the nature of the interaction that we took is the simplest thing you can imagine,” Jafferis explained. If you allow the Hawking radiation from one of the black holes to fall into the other, the two black holes become entangled, and the quantum information that falls into one can exit the other. Stanford, who co-wrote the recent paper with Maldacena and Yang, acknowledged that this is a problem with the simplest interpretation of the ER = EPR idea, in which each particle of Hawking radiation has its own tentacle-like wormhole. However, a more speculative interpretation of ER = EPR that he and others have in mind does not suffer from this failing. “The idea is that in order to recover the information from the Hawking radiation using this traversable wormhole,” Stanford said, one has to “gather the Hawking radiation together and act on it in a complicated way.” This complicated collective measurement reveals information about the particles that fell in; it has the effect, he said, of “creating a large, traversable wormhole out of the small and unhelpful octopus tentacles.